So, just in case you didn't know, Mickey Mouse is celebrating a milestone birthday this year! The world's most famous mouse is turning the big 9-0!!! He officially turns 90 on November 18th, FTR. 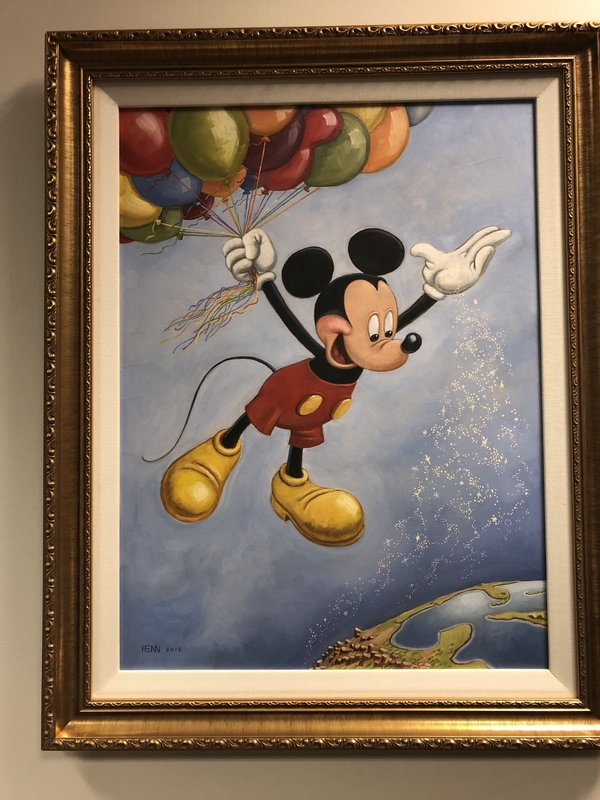 And in celebration of Mickey's 90th birthday, Disney's official fan club, D23, invited us to look at some of the rarest pieces of Mickey memorabilia in the Walt Disney Archives. 1. An animation cel from Mickey's very first cartoon, Steamboat Willie. What makes this especially rare is the fact that in the 1920s the cels used to make cartoons were expensive, so after a cartoon was completed all the cels would be cleaned so that they could be reused. 2. The original script used for Steamboat Willie, which is believed to have been typed up by Walt Disney himself. Walt actually kept the script within his personal files in his office. Within the script is the first known storyboard (with the artwork created by Ub Iwerks), which was something that wasn't done by studios prior to this, but is now done by studios as part of a film's pre-production. 3. The first officially licensed Mickey Mouse product, which was a children's writing tablet. The tablet was released in 1930, two years after the release of Steamboat Willie. 4. The Adventures of Mickey Mouse: Book I which was the first Mickey Mouse book published. The book was first published in 1931. 5. An original Ingersoll Mickey Mouse watch. Ingersoll was the first company to be allowed to produce Mickey watches. Released in 1933, it saved the struggling watch company from bankruptcy. 6. Mouseketeers hats from the first and second seasons of The Mickey Mouse Club. The one on the left (with the "M") is from season one, it's believed they took the ears off and sewed them on the new hats created for the second season, which is on the right. 7. The first prototype Mickey Mouse and Minnie Mouse dolls created by Charlotte Clark and given to Walt. Charlotte, who was a seamstress, was interested in producing Mickey Mouse dolls. She asked her then 16-year-old artist nephew, Bob Clampett (yup, as in the legendary Looney Tunes director), to go to the movies and watch some Mickey cartoons so that he could sketch and give her something to base her design patterns on. Walt and his brother, Roy, were impressed by the prototypes and granted Charlotte permission to produce the dolls. 8. A collection of Disney dolls made by Charlotte Clark and her team. After Charlotte was granted to the right to produce the dolls, Walt and Roy set her up with a small house near the then-Disney studios where she and a small team of seamstresses would hand-make the dolls. Soon the demand was too huge for Charlotte and her team. So, Walt and Roy decided it was easier (in order to maintain quality) to sell the doll patterns based on her original designs. Charlotte continued making handmade dolls exclusively for Walt. 9. A Mickey Mouse doll made exclusively for the opening of Disneyland. Mickey was dressed like a locomotive conductor and accompanied Walt on the train when he first appeared on the opening day telecast of Disneyland. 10. The outfit worn by Mickey Mouse for the 50th anniversary of Disneyland. And he looked snazzy in it! 11. Official birthday portraits of Mickey from 1953 and 2018. 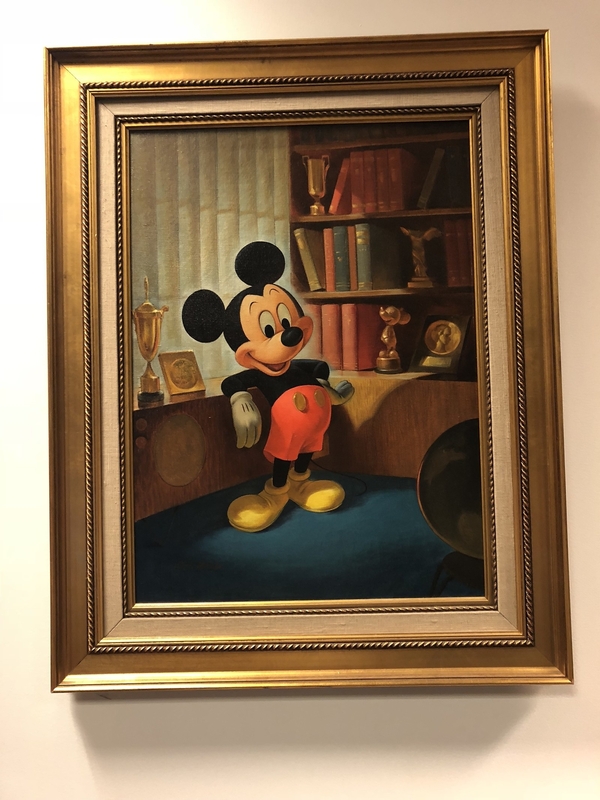 The portrait was done in 1953 in honor of Mickey's 25th birthday, and was painted by John Hench (who was an animator and later an Imagineer). The portrait on the right, in honor of Mickey's 90th, was painted by Mark Henn (who is best known for animating Ariel, Belle, and Jasmine). 12. A newspaper prop featuring Mickey, taken from Paradise Pier at Disney California Adventure. After Paradise Pier was converted to Pixar Pier this newspaper prop (which once decorated the pier) was given to the Archives. This is their most recent acquisition and fittingly ties everything together.